LEAVES THAT FLY is the debut album release from Kim Richards. The making of this album was a long-awaited journey. Kim’s first recording was made at seven years of age onto her cassette player (none of those songs made the cut, although a made up character called Tina Bucket is mentioned!). The seeds of the songs featured were planted at various stages, including a few days alone in a caravan near Gairloch, whilst studying at art school in Glasgow and even during the recording process itself. In the fullness of time she had written quite a backlog of songs and she wanted them to grow. New opportunities took Kim back to her Highland home of Ullapool in 2015 and inspired once again by the landscape, culture and creativity, she knew it was time to finally record an album. Kim has a strong interest in folk tales and Scottish History and this is evident on this album. Kim chose the name 'Leaves that Fly' to evoke journeys and the passing of time. Every song features some sort of journey: getting over the grief of losing someone, the beginnings of a relationship, growing up in the Highlands, or life itself! Kim wanted to bring a sense of community and family to the album. This is shown in Nothing to Show for it All where her dad’s singing is heard and on Passing Tide where the singing of attendees of one of her Sunday Sessions are featured. Kim also designed the beautiful illustrations and art work for the album cover and sleeve which brings together the idea of passing time by creating the sense of change through seasons. She has brought about an otherworldly atmosphere and her interest in fairy tales is clearly felt. In addition to vocals, keyboards, whistles and ukulele from Kim Richards, the album also features the wonderful playing and production of Mike Vass (guitars, fiddle, mandolin, ukulele, programming, backing vocals, and field recordings). 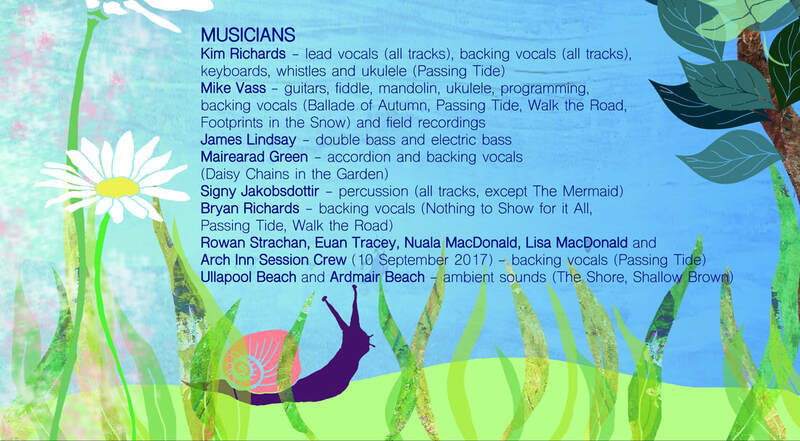 It also includes the brilliant playing of James Lindsay (bass), Signy Jakobsdottir (percussion) and Mairearad Green (accordion and backing vocals).